Even after days on the campground, you can enjoy a hot shower thanks to the heat provided by 60 lbs. of LP tank capacity! The bathroom has a convenient Porcelain Foot Flush toilet, and dirty water is sent to the 58 gallon gray water tank and the 29 gallon black water tank.andnbsp;You want to be sure that the kids get a good night's sleep on the road! 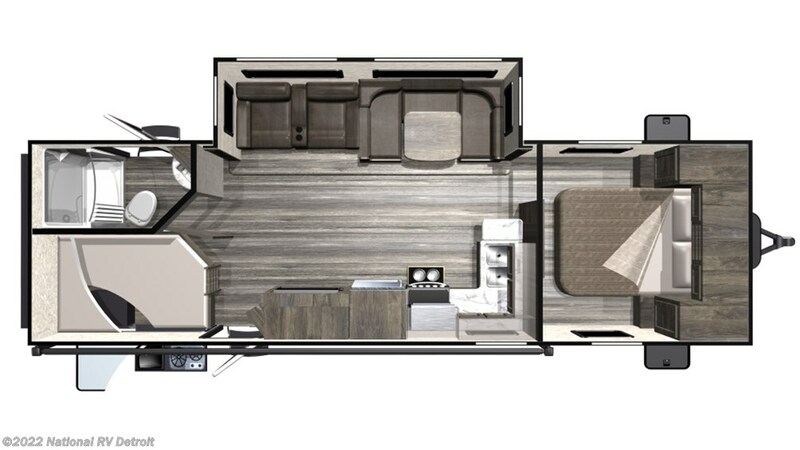 Thankfully, this model has a super bunkhouse with roomy comfortable Bunkbeds that they'll l love!andnbsp;If the weather is gorgeous and the family is having a great time outdoors, don't miss any of the fun at mealtime! Thanks to the outdoor kitchen, you'll make tasty breakfasts, lunches, and dinners and still enjoy your time with the family in the sunshine and fresh air! Check out Stock # 6802 - 2019 Highland Ridge Mesa Ridge Lite MR2802BH on highlandridgesource.com!